The original book was done at same size, using a Brause nib. Photocopies were made on Hammermill Jet Print 24# paper. The cover was photocopied, Gocco'ed and finally handpainted with touches of Schmincke Perlglanz gouache. 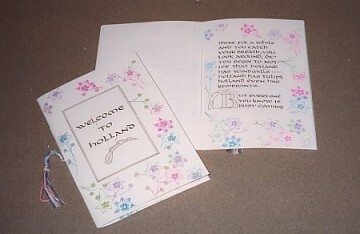 Book 4¼″ x 6¼″ (10.8cm x 15.9 cm). See her artist book in Pauline Sager's 2nd Book Swap. See her artist book in her Montana Book Swap.